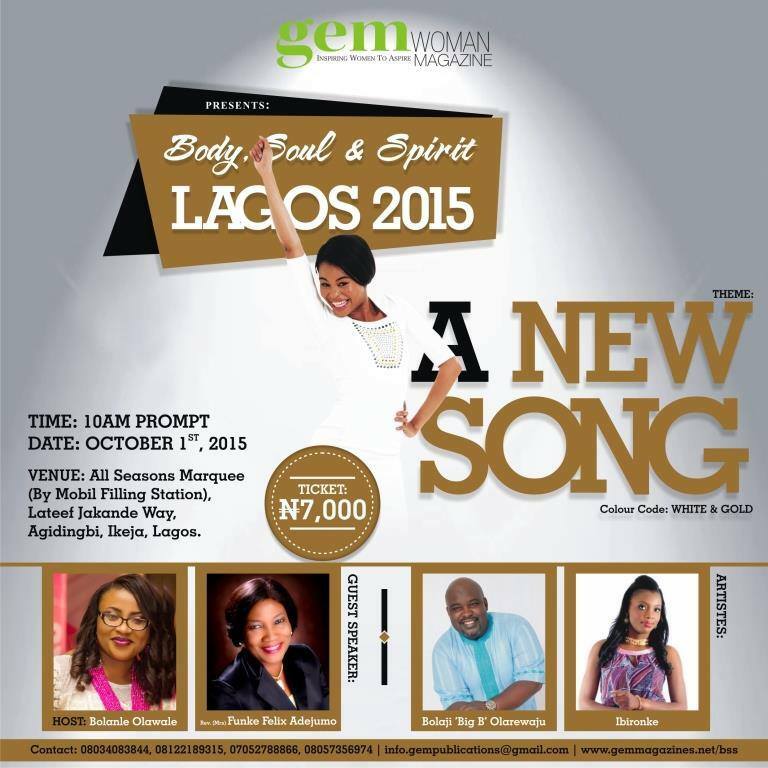 The Body Soul and Spirit is an annual much sought after event for women hosted by gemWOMAN magazine. The objective of this inspiring event is to provide an avenue for women to enjoy all-round rejuvenation- spiritual, emotional and physical, even as they get empowered to maximise their potential. It’s usually a refreshing time in God’s presence, as women relax, share, worship, learn, interact and get inspired. It features myriads of activities that pamper, celebrate and empower women. BSS 2015 will be the 9th edition of the event. Pastor Bola Olawale: Pastor Bola Olawale has a vibrant unrelenting passion for inspiring people; she is particularly committed to restoring the dignity of womanhood, while empowering men and women to fulfil their God-given destiny. Her passion blossomed in the establishment of gem Publications, an excellence-driven publishing firm widely acclaimed for enriching lives. Reverend Funke Felix Adejumo: A Senior Pastor at Agape Christian Ministries, Funke Felix- Adejumo is a woman with deep insight into God’s word, widely recognised for her passion for restoring dignity of womanhood. She travels all over the world teaching women and men alike to possess all the blessings which God has prepared for them in Christ Jesus. Olarewaju Bolaji: Olarewaju Bolaji, popularly referred to as Big B is an ordained music minister with the Redeemed Christian Church of God, on air radio personality, and compere. Big B is a member of the board of directors for the Living Springs Music Festival, which has been in existence for the past 31years. Ibironke Adeniji: A passionate songwriter, exceptional vocalist, music instructor and widely accepted worship leader & minister in Nigeria, Ibironke Adeniji is known for her passion, humility, warm, sweet and excellent spirit. Since 2004, she has been a full time music minister with the Living Spring Chapel, doubling as the music director of the Dominion City Assembly. The theme for this year’s event is A NEW SONG! We believe that women are entering a new season of grace, favour and lifting. Come and tap into this overflowing grace!